Via Neatorama, I learned of an interesting company that is dedicated to keeping reusable building materials out of landfills. Nice, huh? 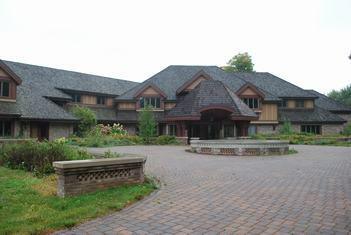 But even more amazing are the photos and video of a 36,000 square foot house that is about to be torn down. This is a tear down? < Previous Who Doesn’t Have Food on the Table? Pittsburgh has a place that recycles building materials. Most of it is junk or ‘landlord’ quality, but apparently if you shop regularly, you can find some very good deals. This reminds me that for no discernible reason, my house came with a new folding, closet door that was not attached to a closet and in fact does not fit any of the closets. I should take it there. Oh, come now MH. There’s an obviously discernible reason. A clueless home-improvement person (perhaps one who also hangs pictures with thumbtacks) mismeasured (or guestimated, or thought that all closets were the same size) and bought a set of doors, only to find that they didn’t fit. In Chicago we have several places that sell salvaged items such as these solid doors, bathtubs, terra cotta (not kidding), bricks. They can be expensive; replacement interior doors for example were at least $200 in 2000. Also these older doors are non-standard sizes which can make it a challenge to find one that fits. Based on his extensive wrangling with this door problem, my husband has an impressive collection of solid wood (mostly 5-panel) doors he’s fished out of various dumpsters over the years. We have at least 20 in our garage. I prefer to consider the non-discernible reason. Like, hidden room? Have you tried going into your closets and closing the door (a la Real Genius)? Yes, I am avoiding grading the final 15 exams. One of our closets does have access to the attic, so who knows what secrets the others might hold. But getting far enough into any of our closets that you can shut the door requires 20 minutes of moving crap. Wow, what does he plan to do with them? And, I’ve been complaining about the 20 boxes of books in our utility room that haven’t been unpacked in the 6 years we’ve lived in our house. I’d get pretty upset about 20 doors in our garage (though we probably have equivalents). My cinder block collection has caused some friction about the house. Our garage-as-door-graveyard doesn’t bother me. The doors are beautiful and deserve to live on. When searching for replacement doors for our own house, my husband ended up digging thru an equivalent garage on the south side of Chicago; it held hundreds of doors, and he had to look thru most of them to find the one that fit in our entryway. The owner of that garage was just a guy, a retired carpenter who was tired of throwing away such nice doors. My husband may end up to be the next generation of that guy. I’m fine with that. Man, that is one seriously ugly house. We have the ReBuilding Center, similar deal, a few miles from my house. Fun but daunting to wander through if you don’t build and fix yourself. Yeah, I was having a hard time figuring out which parts of it to salvage. 15% tops. My husband collects bamboo sticks, whenever he can get them (they’re very light and strong) and he’s started collecting various useful odds and ends when the undergraduates move out. He’s also turned some wheels from a broken stroller (he advertised on Craigslist) into parts for a rolling telescope platform (the assembled telescope weighs 100 pounds). I’m more or less open-minded about the garage, as long as the car still fits in it and there is no massive insect infestation.